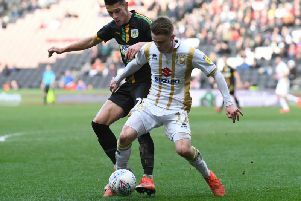 Joe Walsh says it shows how far MK Dons have come to be disappointed after drawing away at Swindon Town on Saturday. Elijah Adebayo's 94th minute equaliser cancelled out the Welsh international's fifth minute strike to leave Dons with a point instead of three, while maintaining their undefeated start to the season. "It's gutting," he said. "When they scored so late it felt like a loss. Everyone is down. We have to get on with it and go again on Tuesday. "In the future, we might look back at is as a good point but at the moment it feel like we've lost three points. It's hard to take at the moment though. "We are going to learn from this last minute goal, we have to see games out and score another goal when we're on top. "We're still unbeaten so that's a positive, we're missing a game next week so we might drop down the league. "Last season, we'd have been happy with a point away, but this season we want to come to every game and want to win."